HTC One Max to take September swing at Samsung Galaxy Note 3? It's like the HTC One....but...bigger, right? September is shaping up to be a busy month. Not only are we anticipating the unveiling of the Samsung Galaxy Note 3, but it might also be going head to head with other phablet contender, the HTC One Max. HTC is rumored to be readying its own larger handset for an "early September release," according to a pesky "inside source" who's up to their usual tricks once again. The source spoke to German site Mobile Geeks, claiming that the Taiwanese manufacturer was eyeing a move into the phablet space for month 9, though they didn't elaborate beyond that. And hey, look at that, the Samsung Galaxy Note 3 looks to be gearing up for an IFA 2013 reveal of its own, which means that HTC could be planning to crash the party - though right now we've no idea if it will coincide with the Berlin expo or not. So far, rumors suggest the Max will be a 5.9-inch, full HD affair, with a 2.3GHz Qualcomm Snapdragon 800 processor and 2GB of RAM. 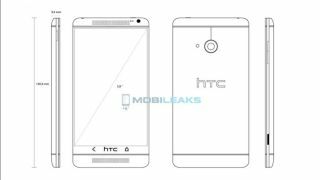 Meanwhile we also await the HTC One's younger sibling, the HTC One Mini, which could drop at any time - perhaps even alongside the Max.